One of the most memorable experiences I’ve had of an old-fashioned Bed & Breakfast was in the lush countryside of southern Ireland. We pulled into the driveway in our rent-a-car (of the smallest, cheapest variety), folded away the map (that’s how long ago this was!) and knocked on the door of a weatherboard farmhouse a stone’s throw from the biggest local attraction: the ruins of Muckross Abbey (think medieval, bluestone castle, albeit with a few bricks missing). She ushered us into her warm kitchen where we shed a few layers, sat down as directed, and were promptly served homemade apple pie still warm from the oven while her daughter chattered away about the drawings she’d completed that morning, in that glorious Irish lilt. It was warm, inviting, homely. The man of the house gave hubby fly-fishing gear and directions to the best spots, and our room, located upstairs, was laden with comforting textures and thoughtful inclusions. This inadvertently became the benchmark for every B&B we have visited since. So when we arrived at the blink-and-you’d-miss-it township of Claude Road beneath Mt Roland, turned down the driveway of Whispering Woods, and were welcomed by Nadine and Matt Scrimgeour, there was an instant whiff of that Irish kitchen so long ago. The Guest Cabin accommodation is one of a smattering of huts that make up the Scrimgeour’s living quarters and outbuildings. They are positioned around a “village green”, flanked at one end by a meandering creek that eventually connects with the Dasher River. 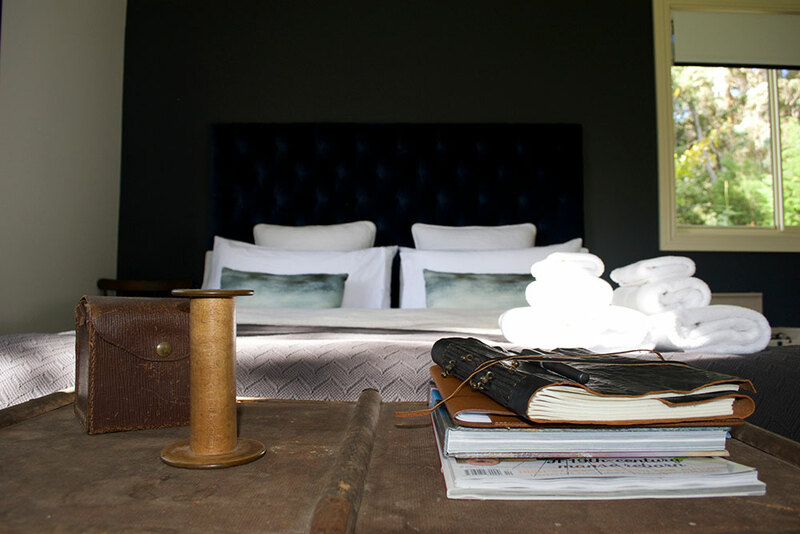 The cabin is completely self-contained and strikes that balance between homely comfort and boutique thoughtfulness. 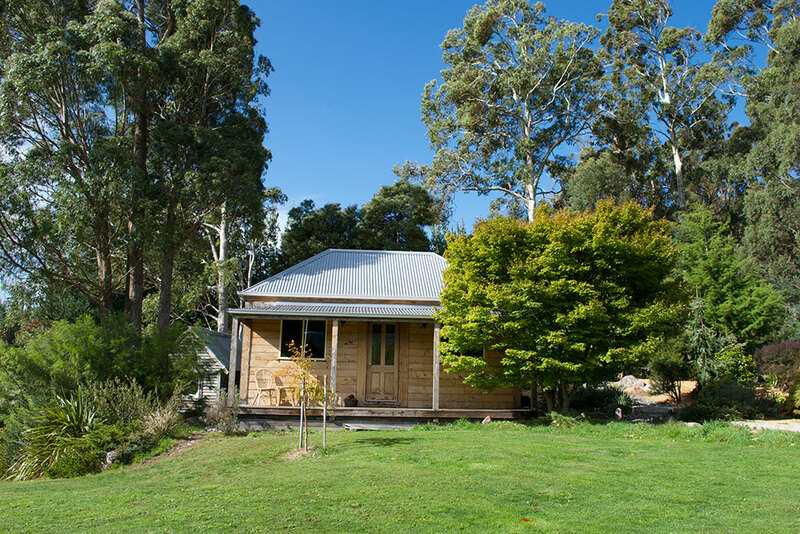 There is a cloud the size of a king-size bed for sleeping on, a wood heater, and the kitchenette is stocked with the most scrumptious Tasmanian provisions for nibblies at wine-o’clock, and a cooked breakfast the next day. All included in the bill. This was one of my favourite parts. Anvers chocolate, milk poured from a glass bottle, a few wines to choose from (the Nocton pinot noir was delightful), Ashgrove cheese, and a sweet, smokey bacon that we quickly devoured with poached eggs and sourdough for brekky. And there was raw honey. The Scrimgeours produce their own raw honey under the label Twelve Acre Wood, and one of the many rustic huts on the 12-acre property serves as a farmgate shop, open seasonally on Sundays and Mondays. While the cabin invites you to hibernate with fire crackling and wine in hand, it was good to throw on the puffa and stomp around the property’s perimeter, breathing in that bracing country air and craning the neck at the rugged crags of Mt Roland. Which is as epic a mountain as you will get in Tasmania, in my humble opinion. Of course, Cradle Mountain is only 45 minutes away, if you disagree. We walked with the family’s beautiful Border Collie Apexi at our side, and were later greeted by the friendly sheep Robbie, who nudged our legs and nibbled at our jacket zippers. It’s the little things that make memories, and distinguish straight accommodation from the warmth of an old-fashioned B&B. Old fashioned in all the right ways. Our Irish B&B benchmark may just have a contender.